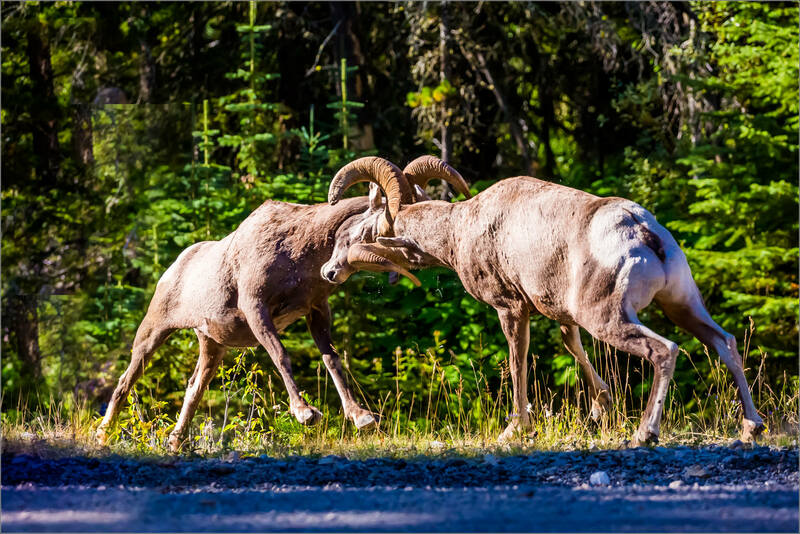 On one of our morning drives, Kian and I came across a few Bighorn rams on the Akamina Parkway near Cameron Lake in the Waterton National Park. These were adolescents, not the adult males which will battle for the attention of the ewes in the fall. Nonetheless, a couple of them were practicing their rutting between grazing on the roadside vegetation. 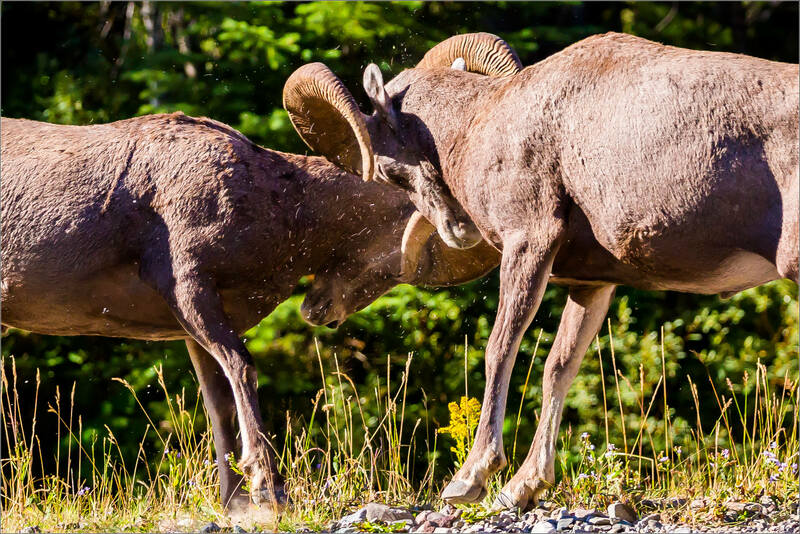 When the big boys crash their horns together it can echo across a valley. These battles didn’t carry that kind of power but it was great action with no lack of enthusiasm. We were able to watch three battles and my son and I both loved watching, and hearing, the collisions. I do wonder if concussions are a problem as they are with human contact sports. 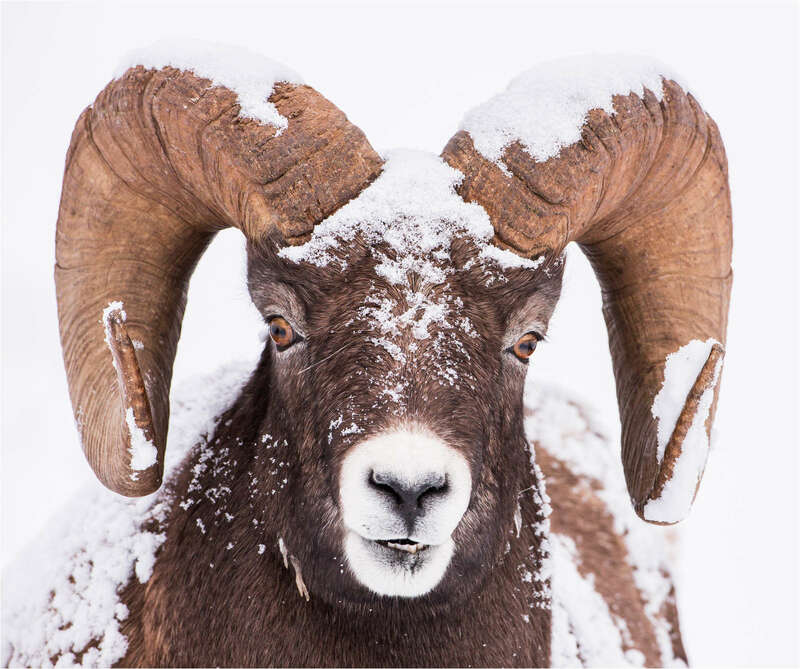 The wildlife photography workshop in Jasper is drawing to a close and it has been a great opportunity to put in some great time with the camera. 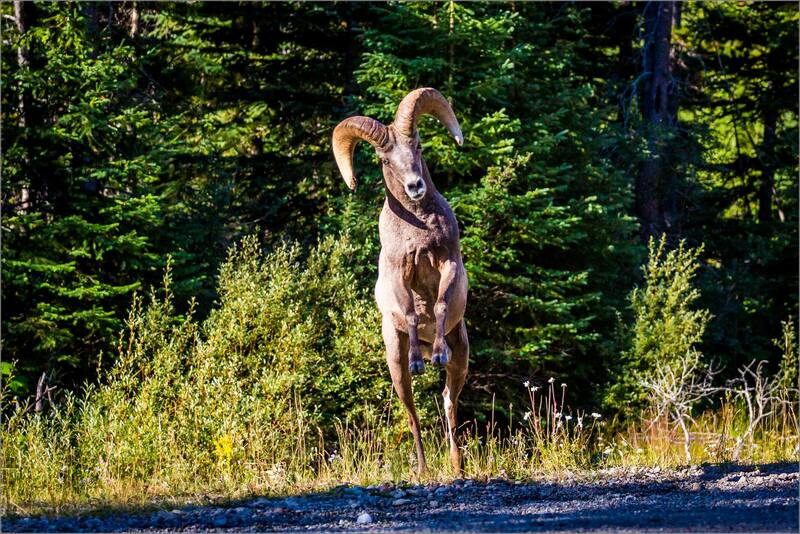 This ram was a subject of our collective attention early in the workshop and on one of the mornings he had led his herd up to one of the hills along the Maligne Lake Road. The snow caked along his face and down his back was a nice detail to work with. Now back along the Icefields Parkway back home to my family. And across the town with the kids for Hallowe’en treating and trickery – I can’t wait. Today was a great first day for the workshop I’m up in Jasper for. The workshop is led by John Marriott and it has been great picking up some of his vast knowledge of animal behaviour, tracking and anticipating a better moment. Over the 11 hours we were hiking, driving and scouting in the Greater Jasper area, we tracked several moose and wolf trails. That was really great – it didn’t deliver us onto either of these animals but such a good opportunity to learn. 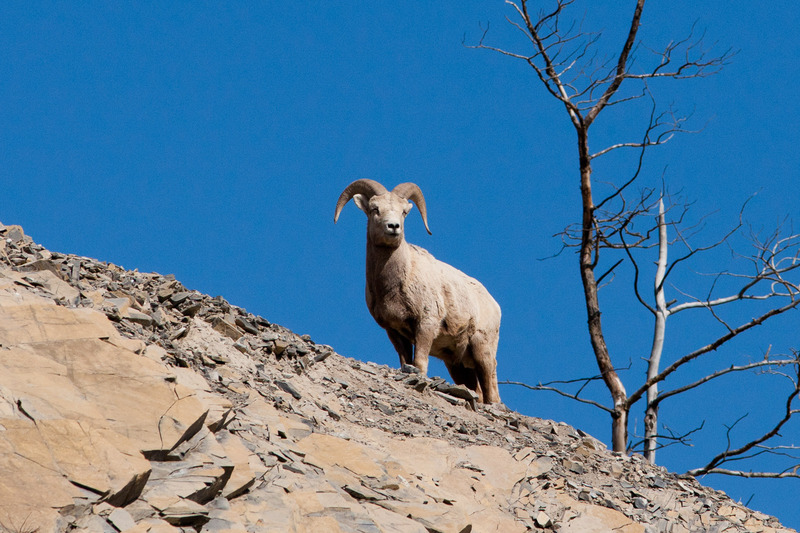 We did find many (many, many) groups of bighorns scattered around, a couple of elk encounters (one herd and a couple of individuals) as well as a few deer here and there. 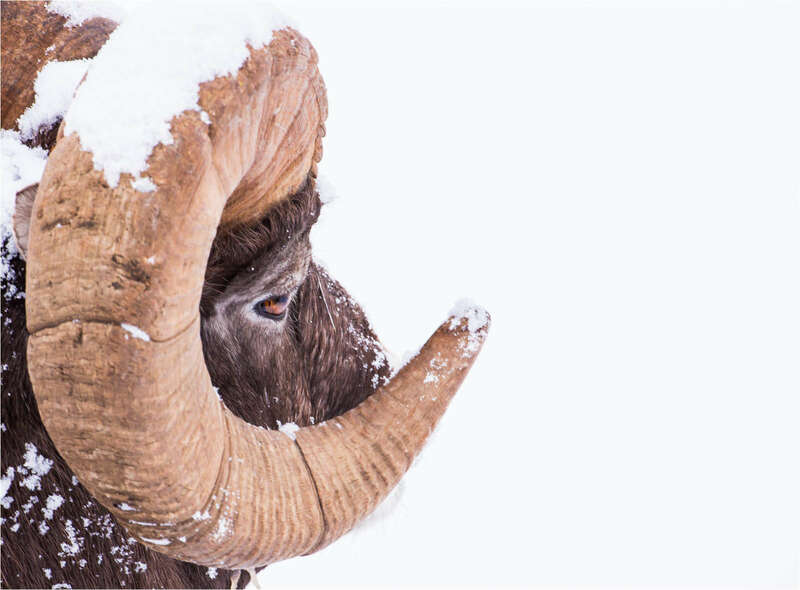 It was the Bighorn sheep that captured most of our attention and we spent a couple of hours on a slope where roughly twenty rams had assembled as we enter the front side of the rut. We waited for the head butting but they weren’t in the mood. It proved to be a wonderful opportunity to watch their behaviour and photograph subtle behaviours. 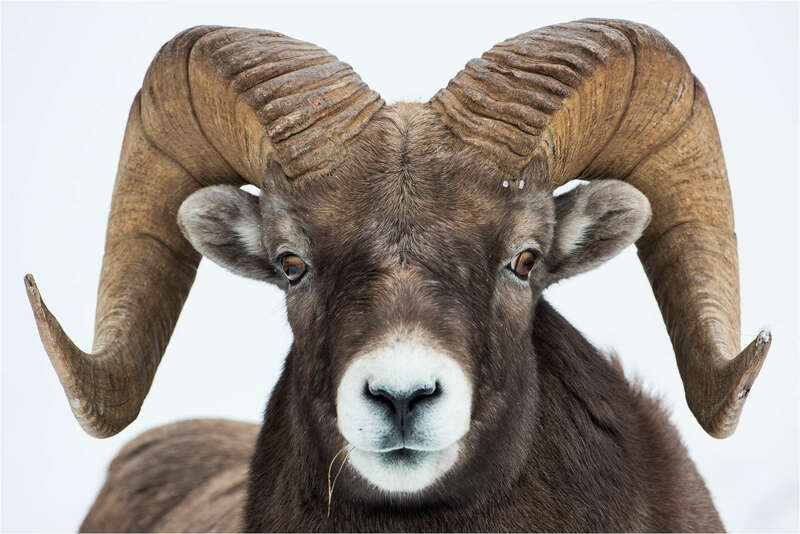 This male typified the braggadocio of some of the larger rams. It was a really good day. A large group of ewes were walking along this ridge with a gang of frisky youngsters in tow. 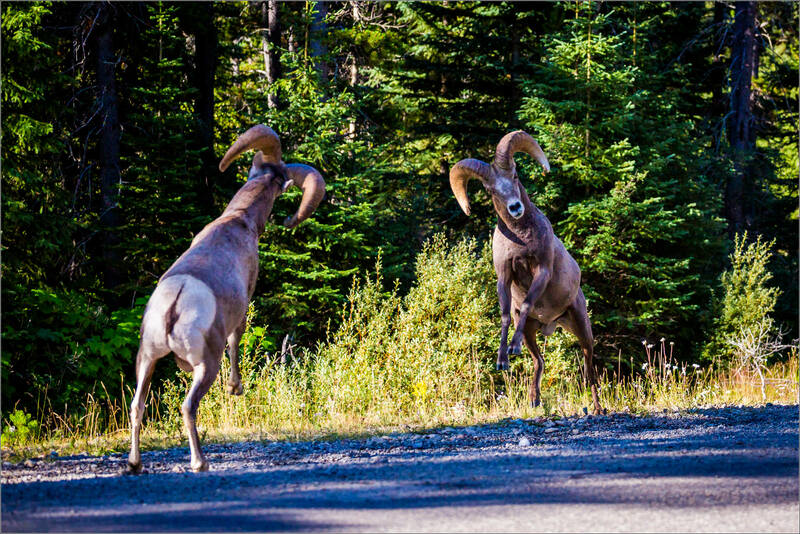 A bit further down the road were 12-15 rams that looked to have separated from this group as they were grazing on the south side of the highway. Maybe they were sneaking away for some guy time. This is around the time lambs are born but I didn’t see any really small ones here. Not sure if they will be born soon or if they have been already and their mothers are keeping them in more remote spots for now. 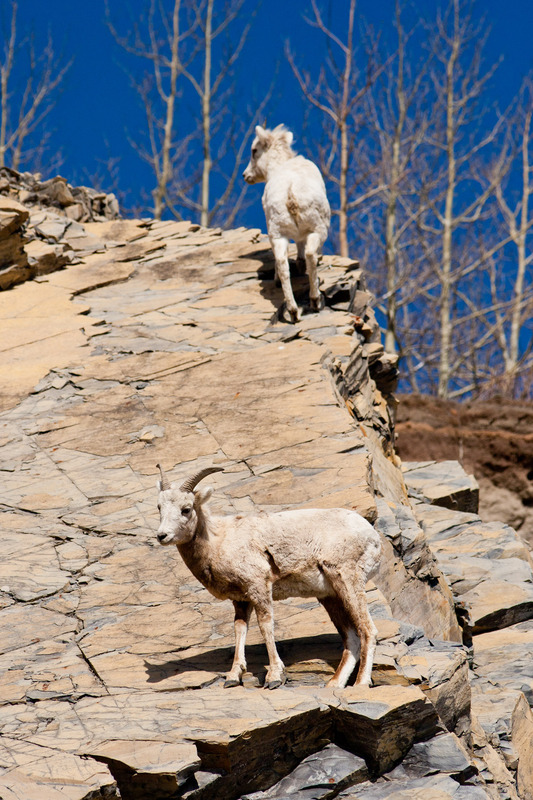 These two younger lambs did not have the sure-feet and confidence of their more mature brethren which made their traverse of this steep, jagged part of the rock below the ridge an interesting walk to follow. 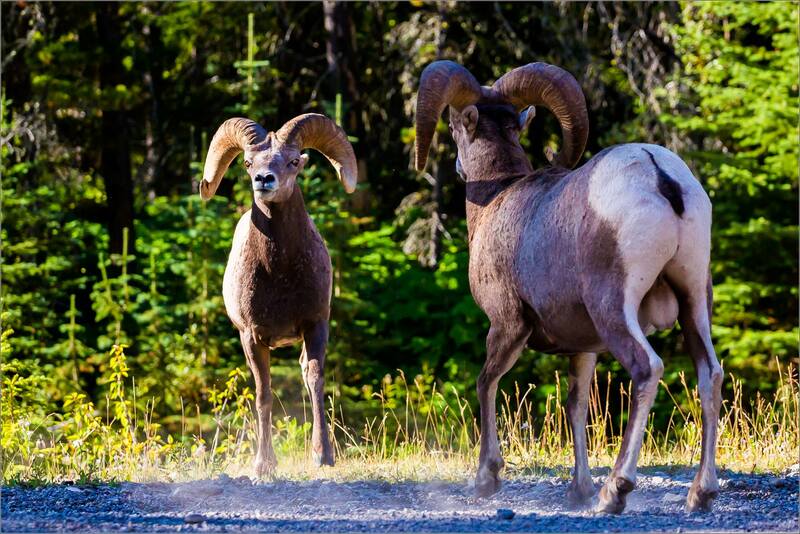 There are a number of great locations to see Bighorn Sheep when heading into the Rocky Mountains from Calgary. The place where I made these pictures is one of the most accessible: it is a long stretch of the Bow Valley Trail between Exshaw and Canmore. 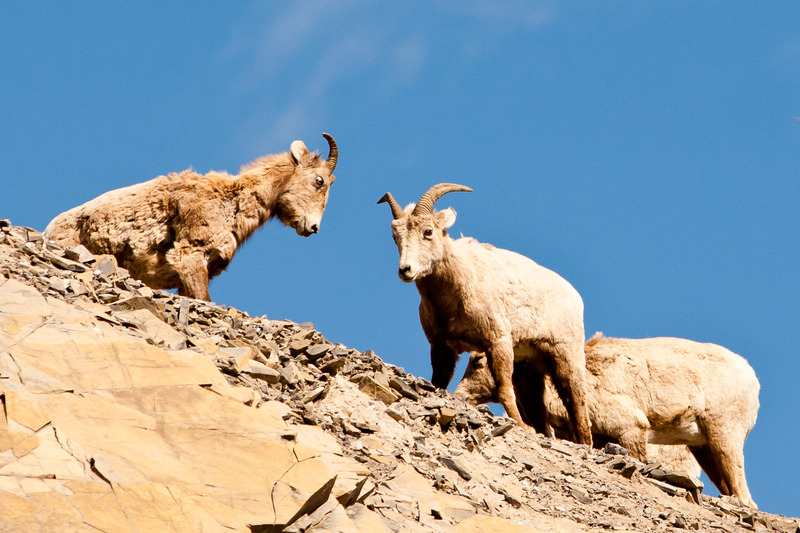 The sheep can be frequently seen right beside the road, up the mountain slopes on the scree or, more dramatically, on the cliffs that loom 60′ above the road just north of Lac des Arcs. This ram came up a few minutes after the herd of ewes and lambs had gone. 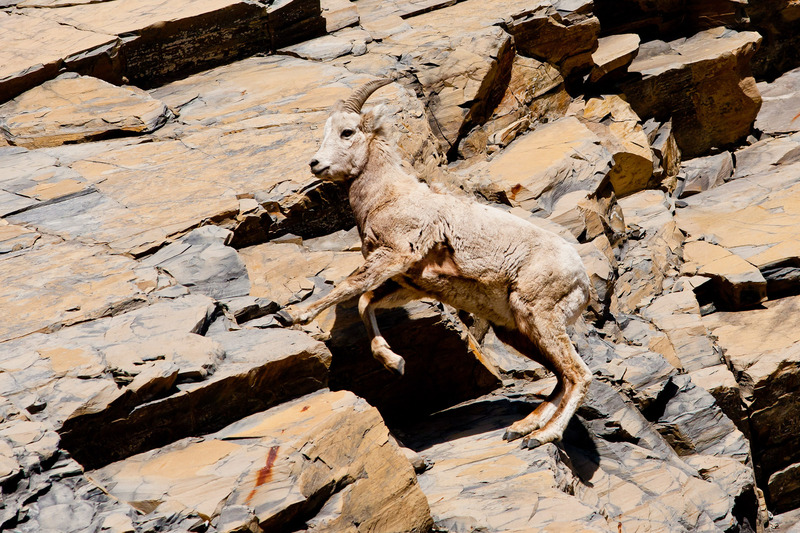 He was a beautiful animal and we loved watching him stride across the rocks. This ended an incredible day on a fine note after having seen a herd of elk, a moose, a Barrow’s Goldeneye, a grebe, a mating pair of osprey, several hawks and a bald eagle between sunrise and sunset.